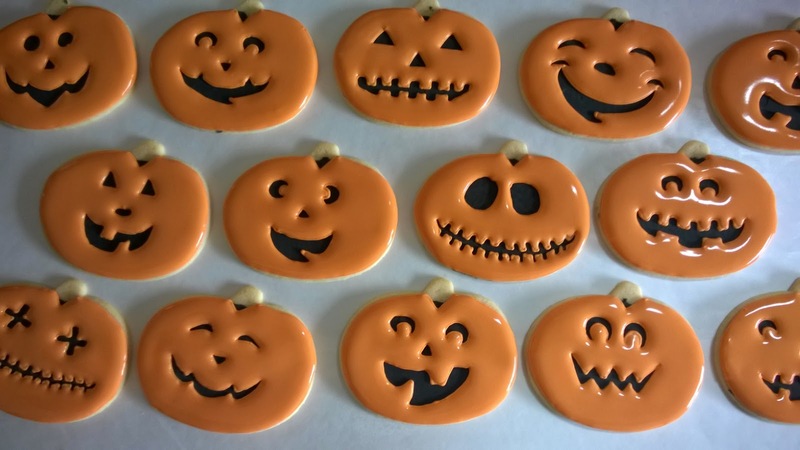 For these cookies, I used the pumpkin cookie cutter in the Wilton 101 cookie cutter set although just about any medium to large sized pumpkin cookie cutter would work for these. 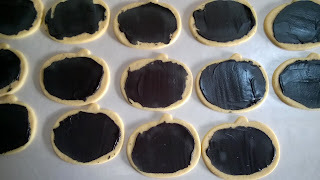 I wanted these jack-o-lanterns to have a layered look with the black jack-o-lantern faces receding into the background, so I used the technique where the black icing is spread flat onto the cookie first and all other icings are layered on top. I have included a few pictures to show how this works. To spread the black icing onto the cookie, I used an angled cake icing spatula to place of small glob (approximately 1/2 tsp.) 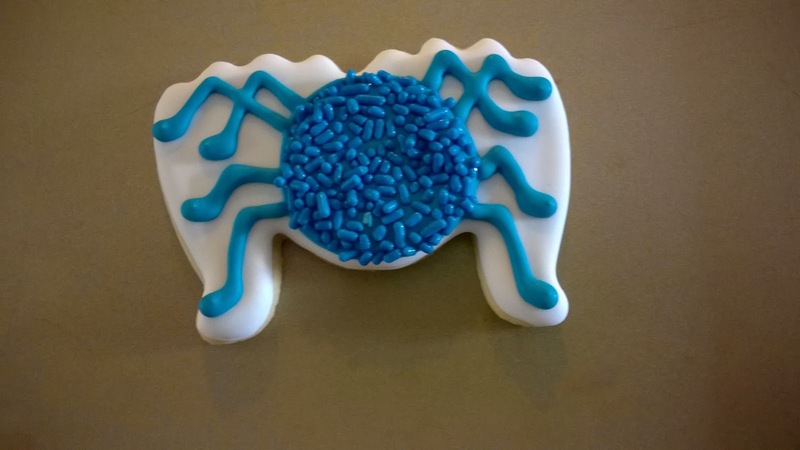 of icing onto the cookie. Then I carefully and evenly spread it with the spatula, making sure to not get it too close to the edges of the cookie. The black icing was stiff but not quite outline consistency - closer to 20-second consistency. 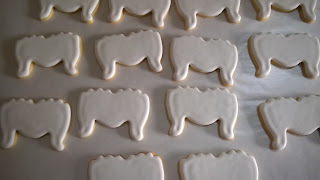 I needed it to spread easily but not run off the sides of the cookies. 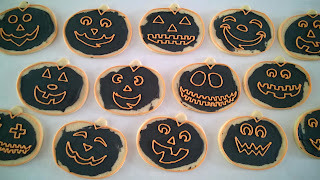 Once the black icing was dry, I outlined jack-o-lantern faces onto the cookies and the outside edges of the cookies. I left a small indent at the top so that I could add the pumpkins' brown stems and leaves later. 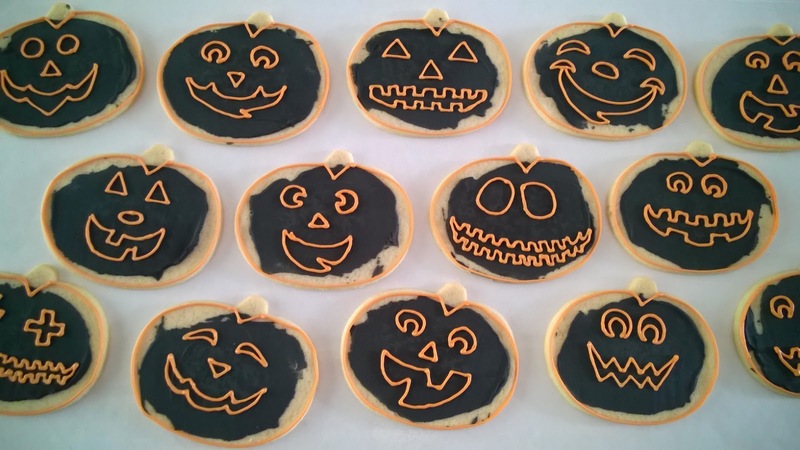 As soon as the outlines were dry, I carefully filled in the pumpkins with a Wilton #2 tip and orange 20-second consistency icing. I was careful not to overfill with the icing, otherwise it might run over my outlined edges and into the jack-o-lantern's faces. I left these overnight to dry. Then I added the additional details - the brown stem, leaves, and top outlines as shown in the finished picture at the top. This is the complete set. I added the owls with witch hats. 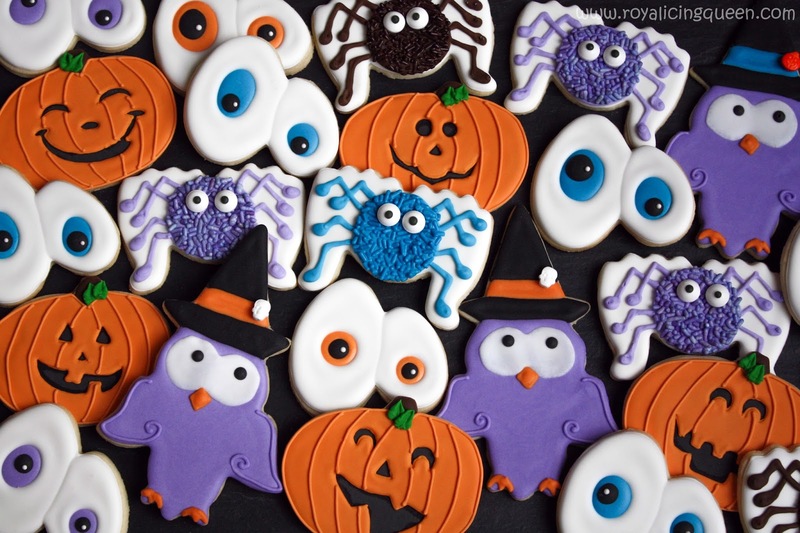 The cookie cutter is available here: Witchy Owl Cookie Cutter. 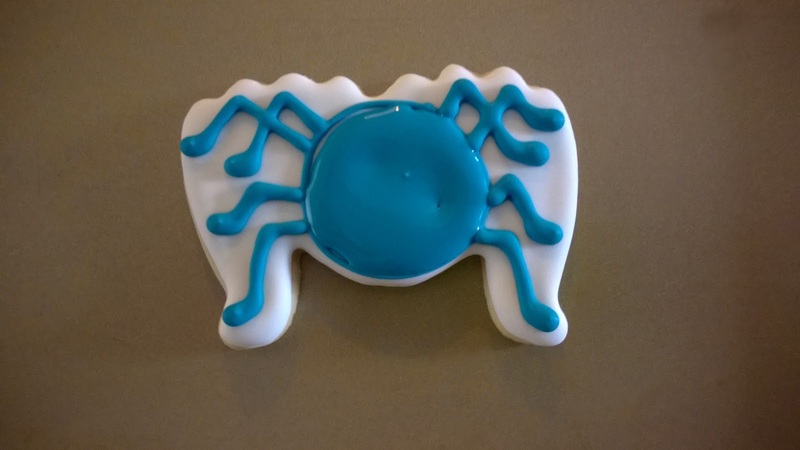 The cookie cutter I used for these spider cookies is available here: Crouching Spider Cookie Cutter. 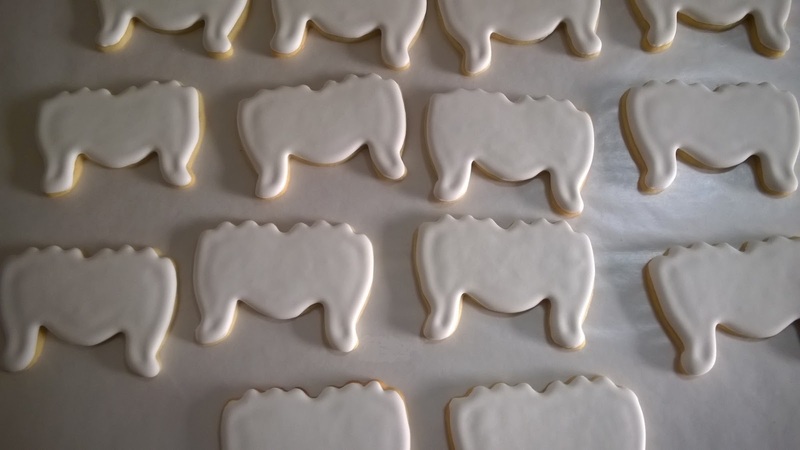 When I decorate cookies, I don't like to leave any parts of the cookie undecorated so, first, I outlined and flooded the entire cookie with white royal icing. I left it overnight to dry. Next, I outlined a circle in the center of the cookies. I used my projector to trace the circle because I am terrible at freehand drawing circles. I used a Wilton icing tip #2 to add the spider's legs. I let these to dry for about 2-3 hours and then flooded the center of the circle. While this icing was still wet I added some Jimmie sprinkles to the top of the circle, and then I gently tapped off the excess. I let these dry slightly, and then I added some leftover icing to the back of two Wilton Candy Eyeballs. 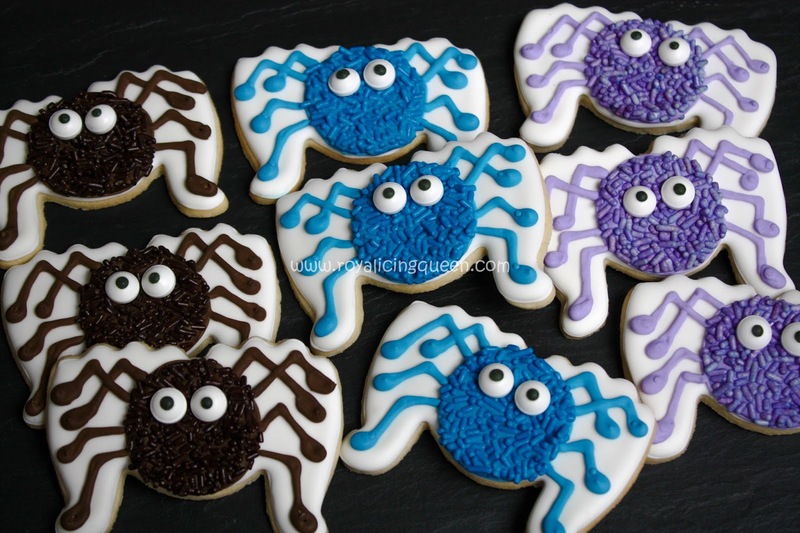 I carefully placed the eyeballs on the front of the spiders for the last, finishing touch. 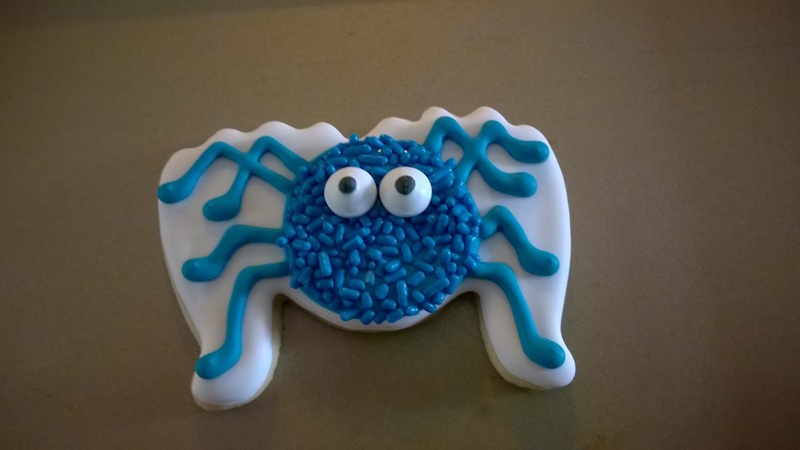 This step can wait until the spiders are completely dry, but if you are careful you can add them while the icing is still drying. 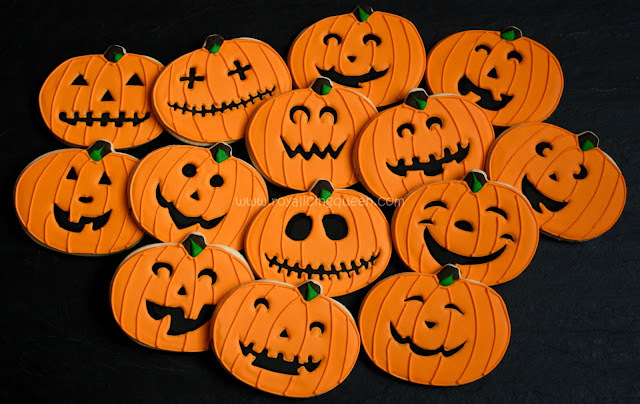 I've started making Halloween cookies for the season. 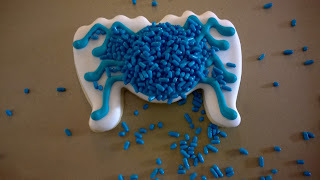 I'm making a few different types that are meant to go together. 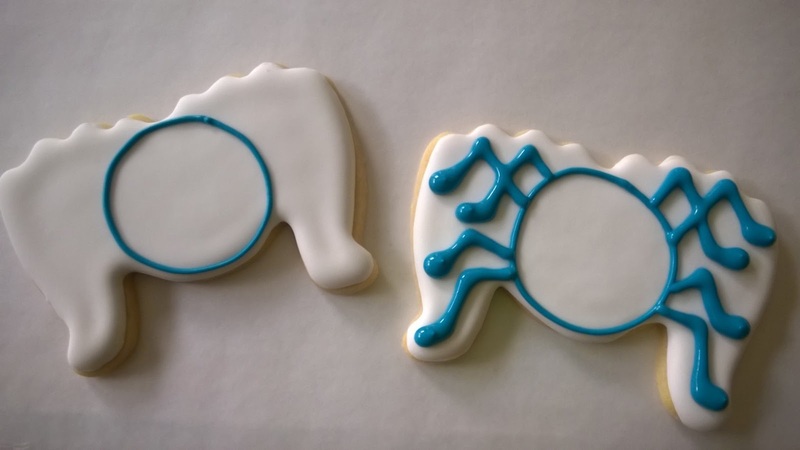 These eyeballs are a simplified version of Sugarbelle's Easy Eyeball Cookies. The cookie cutter can be purchased here: Spooky Halloween Eyes Cookie Cutter.